I taught Kindergarten and Junior Kindergarten (4’s and 5’s) in the same school for nearly 4 decades. 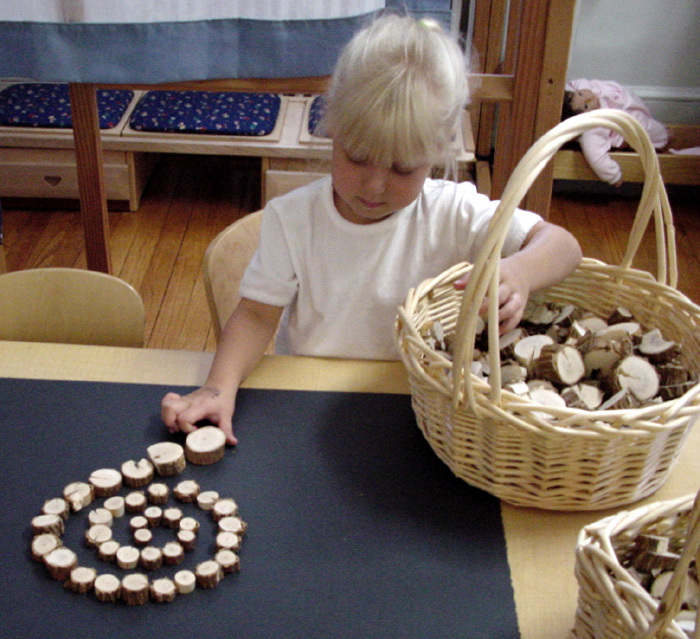 For 26 years, essentially the entire time I was in JK, we were Reggio inspired. I had noticed early on a remarkable difference from my pre-Reggio experiences: the children were so much more self reliant/interdependent. They moved about the classroom with greater purpose. If they had an idea, they seemed confident that they could make it visible. And they had so MANY ideas! If there was a problem, with the work or with each other, they assumed that they could solve it, and were confident that if they got stuck an adult would help them without taking over the project. They sustained interest in their undertakings for longer and longer periods of time, days or weeks sometimes. They cared for and helped each other. When information came their way, especially on a topic they had explored, they seemed to assimilate or accommodate it so much more easily. As a side-effect, literacy and math thinking seemed to come easily to them. I called this state of being “The Awake Mind,” because that is how it felt to me. I wondered and worried though. Was this phenomenon specific to my setting, to my teaching? I hoped not. No theory is useful if it is not replicable. Now, as I work with Kindergarten teachers in a public Title One school, I am thrilled to see that the Awake Mind is not a one-off. This is year two in a pilot program for teacher, Jen Miller, who wanted to bring the Reggio philosophy to her teaching. Her students are self-reliant and interdependent in the classroom. If they need a boom box for their imagination play, they slip over to the making place and create one. Their play has grown more intentional and more language-driven. Their collaboration is rich. 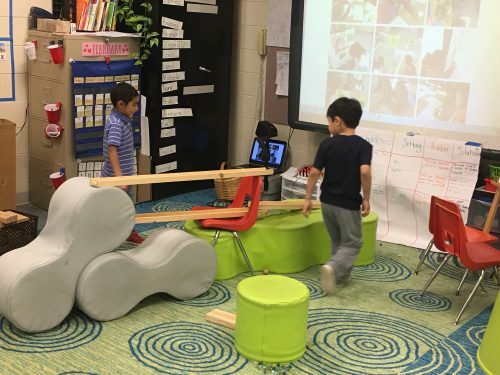 They are challenging themselves in every medium, including some impressive physics play with ramps and balls. Here are a few examples of the awakening mind in Jen’s class. Charlee entered Kindergarten shy and uncertain. But by this time of the year, she had found her voice. 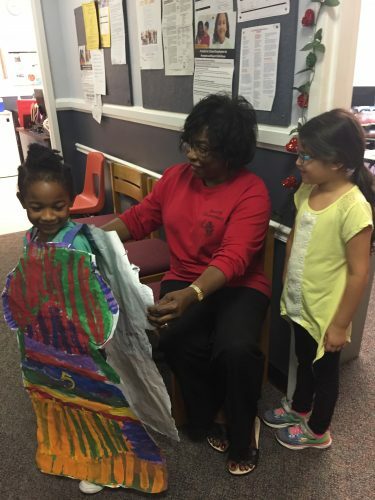 She wanted to show the principal the dress she had spent several days designing and creating, with some collaboration…not needed but graciously accepted…from her friends. She took a friend with her to show the principal but was able to speak for herself when they got to the principal’s office. Charlee’s expression revealed the pleasure she felt at the interaction. Here is the jist of part of the conversation between Charlee and the principal. Principal: What does the 5 on your dress stand for? Principal: What size do you think I am? Principal: Will you make me a dress, too? In size 7, though, not 17. Charlee: OK. I will write 7 on your dress. The children’s ramp-building evolution has led to more and more complex systems and multiple layers. Two boys created their own game using marbles and a crate that normally holds blocks. Lately, Neymar has been commenting on the quantity before him, both real and imagined. Both boys counted the marbles and reported the result. 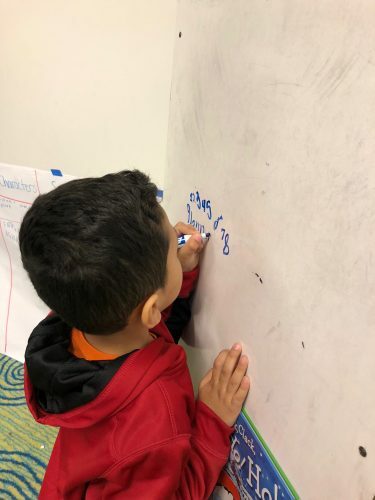 A third child, witnessing the interaction, went to the white board and wrote the numerals to go with the quantity of marbles. There are hundreds of moments like these, with children claiming their own learning. The awake mind appears to create a spiraling learning sequence: the self-challenge feeds the intellect, which seeks out more experiences, greater challenges, and more ways of sharing discoveries…which brings pleasure and encourages more self-challenge, and so forth. The challenges and projects become more and more sophisticated and the learning deeper and apparently more transferable. 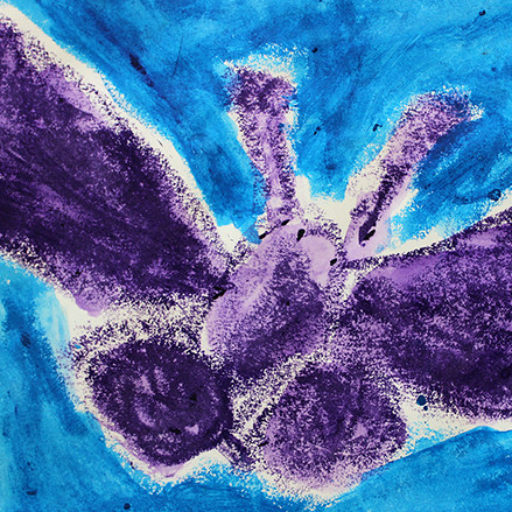 In the other Kindergarten classrooms, though they have only been part of the pilot for 6 months and on a limited basis at that, where teachers have shifted from activity-oriented “centers” to materials-based opportunities, teachers have observed with delight children’s imaginations become visible, and their investment greater…a starting point for awakening minds. I have been delighted to observe that the Awake Mind is, indeed, a replicable theory. And so, the work continues.